What prompted the great Argentine sailor Vito Dumas to set off to sail “solo” around the world? I´ve read a lot about it, and I have no doubt about his courage, his marine knowledge, his personal organization or his expertise on solving situations in extreme conditions, but a curious idea crossed my mind for a moment, that it might have been difficult for him to find a travel buddy for such an adventure. I can imagine endless possible excuses among his friends; “can’t make it this weekend”; “maybe the next one”; “my family wont let me”; “too many kilometers”. The life of the adventurer is hard, but being alone empowers, and gives a sense of motivation. One Sunday morning, while part of the country acclaims King Momo, i decide to begin a journey that was thought of and postponed several times. I’m going for a ride, and the destination is the legendary Pueblo Escondido (hidden village) in the province of Córdoba, Argentina. I got my Reid bicycle by my side. And just like Mr. Dumas, when I told my loved ones about the journey, they also said I was crazy. 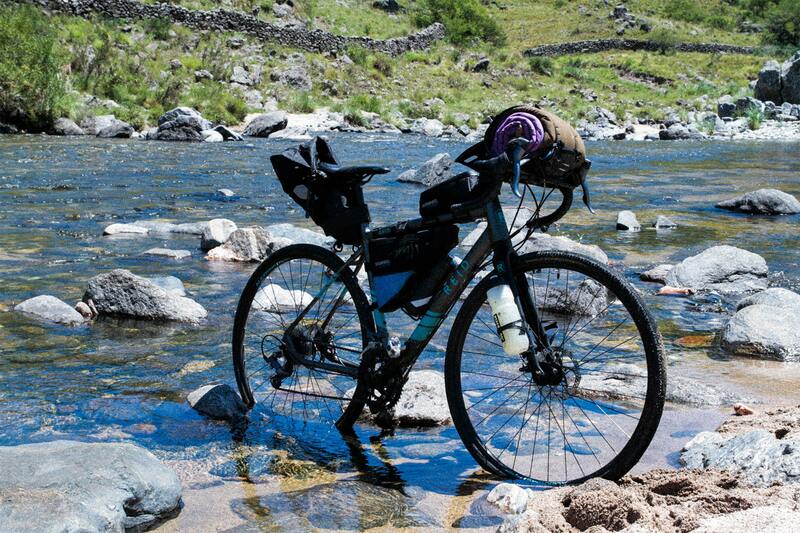 A 48-hour bicycle tour should be cataloged as an express adventure in the manual of the cyclist. Taking into account my case, and with the idea of sleeping one night in the car and the other in a shelter on the mountains, i can avoid carrying a tent and my big panniers. The five small bags placed strategically on my bicycle, allow me to carry the basics for this excursion. 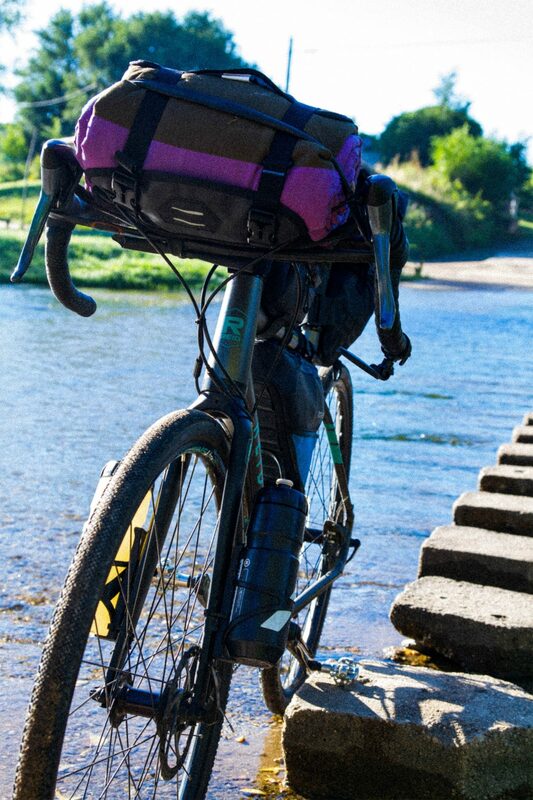 Ladies and gentlemen’s this is called Bikepacking, and it is the evolution of bicycle touring. It eases the ride, reducing our total weight and allows us to enjoy a fast and aggressive ride. Such a pleasant and strange night, both at the same time. An improvised bed in the back of my car serves as temporary shelter to sleep, hugging my Australian partner close to me. 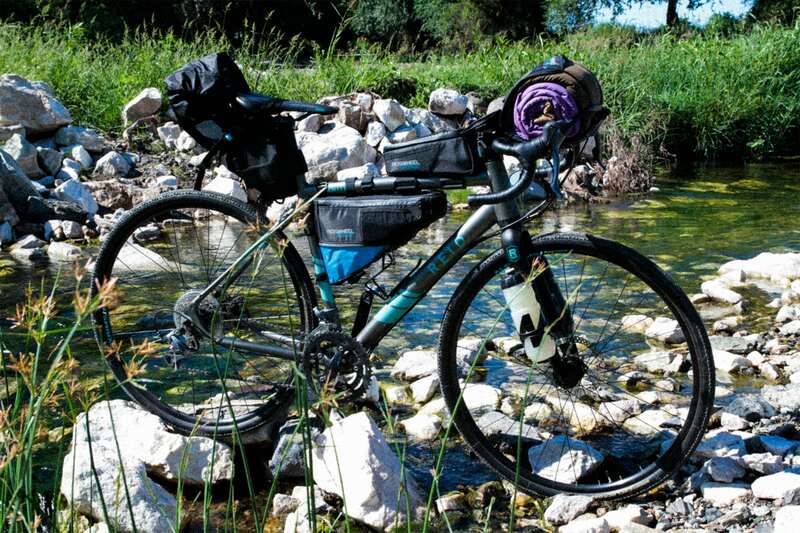 To avoid confusions i would say that this geographical origin is that of my Reid Granite 2.0 bicycle, a machine thought and designed for bicycle touring. 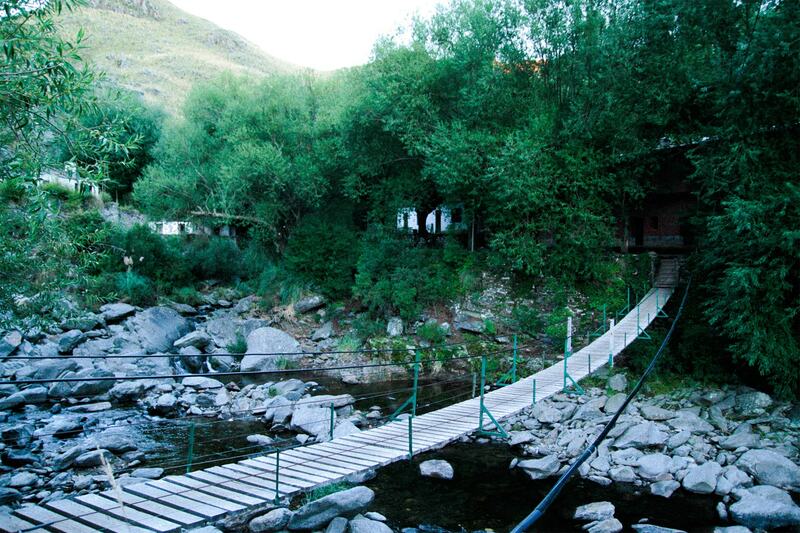 Río de los Sauces (willows river) is a small town located on Cordoba´s mountains, divided in two by a river, which by the way has many willows. It’s 8am and after leaving the car at the town´s campsite, under the shadow of one of the trees that gives the place it´s name, I start the tour aiming to sleep the next night in Pueblo Escondido. 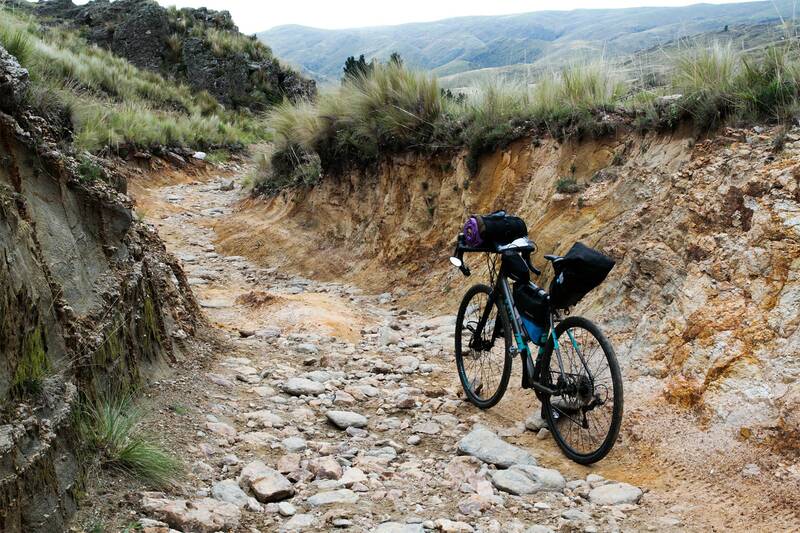 My bike´s tires are already leaving a footprint on Cordovan lands. After many hours of research on the internet, the route was already stuck on my mind. Leaving town I go north to La Cruz and then left at the first detour after 10 kilometers. From this point begins a long road in which the climb it’s going to be painful and nearly forgotten during any descent (forced by some glen). The 80km programmed for that day are hard and I take them easy, the landscapes so deserve it. I stop for lunch next to a river at sight of a giant lizard, and later for a short siesta (nap) under a small tree on the side of the road. Key notes for the travel log. It’s getting past noon, when out of nowhere I see a small cabin. A rusty and blurred sign offers drinks and “choripánes”. No one on sight invites me to continue my journey, but I stop for a while and share the shadow of an old tree, with the improvised kiosk. I can only hear my agitated breath and with little hope I knock at the cabins door. A few seconds later, the owner of such an enterprise appears as if he were walking in slow motion. When asked for a drink, he does not hesitate to express: “water, sodas, juice, beer …”. Surprised by his answer, I decide for a Coke and the good gentleman, looking like a gaucho extracted from a painting by Molina Campos, enters the cabin and returns with a bottle of the precious potion. The price did not surprise me at all, but it’s almost frozen state did. I could see the ice crystals blooming inside the bottle. What kind of witchcraft is this in the middle of the mountain! The good man’s answer was frank: “I have a gas powered freezer.” Several enduro motorcycle riders arrived at the place. A few minutes of resting served so that the clients gathered around that old cabin decided to name this man the “entrepreneur of the year”. The day was long and the journey was very hard. I left in the morning from 600 meters over the sea level, and when the clock shows 8 pm I am at 1700 meters, just where the detour to Pueblo Escondido begins. In the first act of The Divine Comedy, Dante (the main character) finally enters hell’s gates and find an inscription: “Abandon all hope…”. 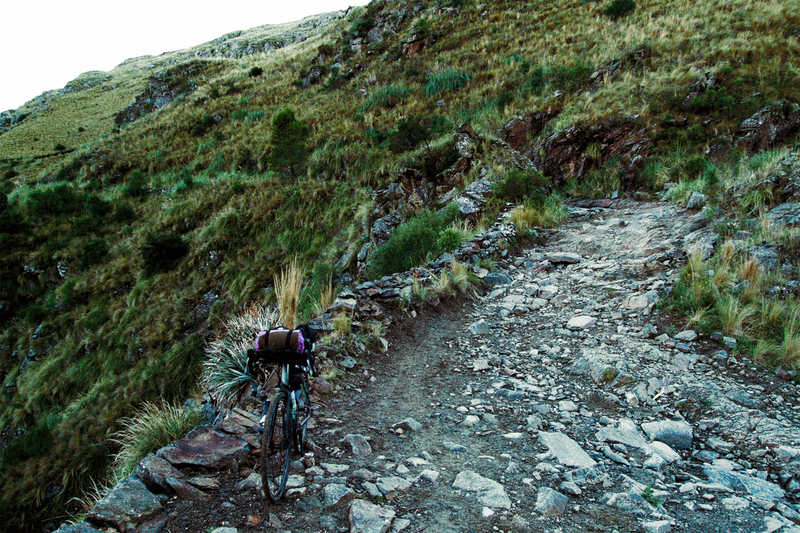 There is no one to confirm the end of this detour, not even a sign, but the geography of the road, its Dantesque descent and some trace of quadricycle tires, invite me to descend with the hope of finding Pueblo Escondido. A footpath barely a few meters wide, packed by rocks the size of footballs, and the low light of dusk, forces me to walk 5 kilometers over an inclined plane. My ankles hurt and my shoes cleats slip on the rocks. Halfway through the path opens and I can see the silhouette of the hidden village at the bottom of the ravine. The last kilometer of the route is full of vegetation, reassembling a jungle landscape, so I must use my powerful Knog light to reach destination. I´m greeted by the constant weep of the river that borders the town, and by the hanging footbridge that I must cross with a firm step to avoid the wobble. I can recognize the main construction of the place. It belongs to an old mining camp that was full of life in the middle of the last century, before tungsten became cheaper to buy from China. A weak led light, powered by no more than 12 volts, attracts me like a lighthouse to encounter the owner of the place. Carlos leads me to the room I rent for the night. A shoebox three meters wide, with a mattress on the floor, where I’ll put my sleeping bag. I leave my Australian companion under shelter and my host takes me to the dining room. It’s 9pm and dinner is about to be served, the table is communal and I share it with my occasional comrades. The never-changing menu: Pasta, but with the nice possibility of endless refilling (with 4 sauce options, two of which I would think are the same). The accumulated fatigue of the day prevents me from memorizing the name of the people gathered there, I only remember a sign at the entrance: “No strangers here, only people you do not know yet”. Three Frenchmen, not so French any more after 20 years living in Buenos Aires, a young couple from Villa María and I. We wiped out the remains of the dinner. After dessert nobody can avoid the challenge of some card games. I am at the bottom of a deep valley, surrounded by mountains. 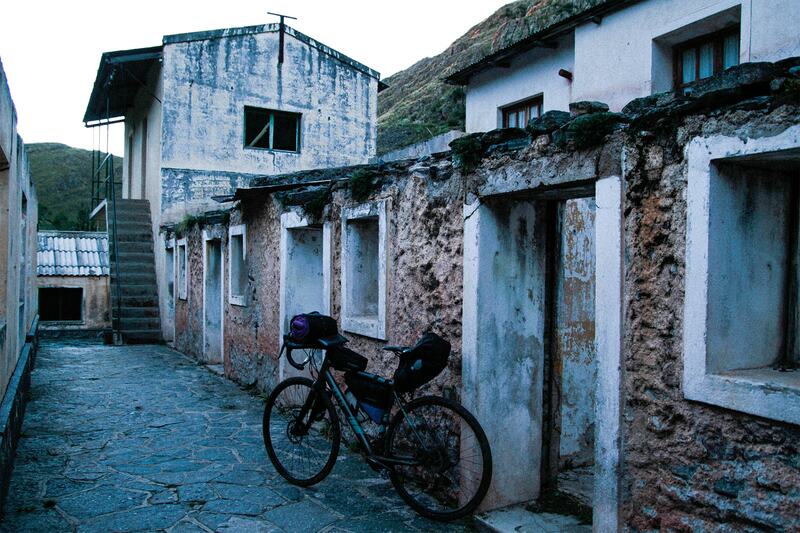 No electric power, wi-fi or telephone signal, simply enjoying the magic that can only be offered by a bicycle tour. Fatigue is overwhelming and dawn lurks. The night is over. I sleep like never before in my life, or rather like a cyclist who devoured 80 kilometers of steep climbs. No need for an alarm clock, just to pay attention to the sounds of dawn. 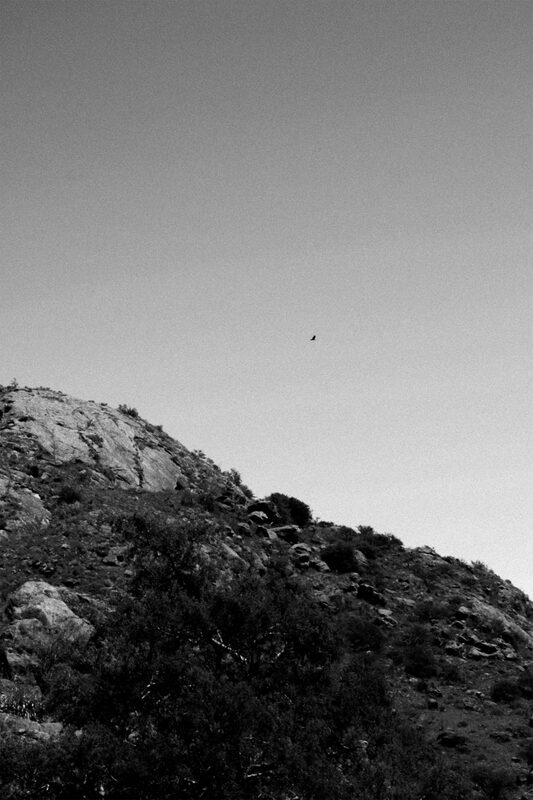 In Pueblo Escondido there are plenty of birds and they let me know it as soon as the sun came out. On the hard climb to the main road, I seize the opportunity to take pictures and to say goodbye to this magical town. Again on the main route, a descent beings and I enjoy it, but after a few meters a terrifying impulse makes me rapidly block my two brakes. I realize that I had lost my phone at some point of the climb, while leaving the town. Three cows on the side of the road are petrified and observe trying to understand the strange sounds produced by this cyclist who is simply cursing everything that exists on the face of the earth. I return to hell’s gates. I hide my bike inside a bush and start descending to Pueblo Escondido for the second time in my life. What a record I thought. About three or four kilometers further down I managed to find my phone among the stones. Eleven hours, thirty-six minutes. I get on my bike and resume my return. The three cows are immobilized again before my war cry. “I f@### found it!”. The way back was almost the same, a brief stop at the most famous entrepreneur on Cordoba´s mountains, and an alternative road recommended by the same man, but now acting as an expert touring guide. 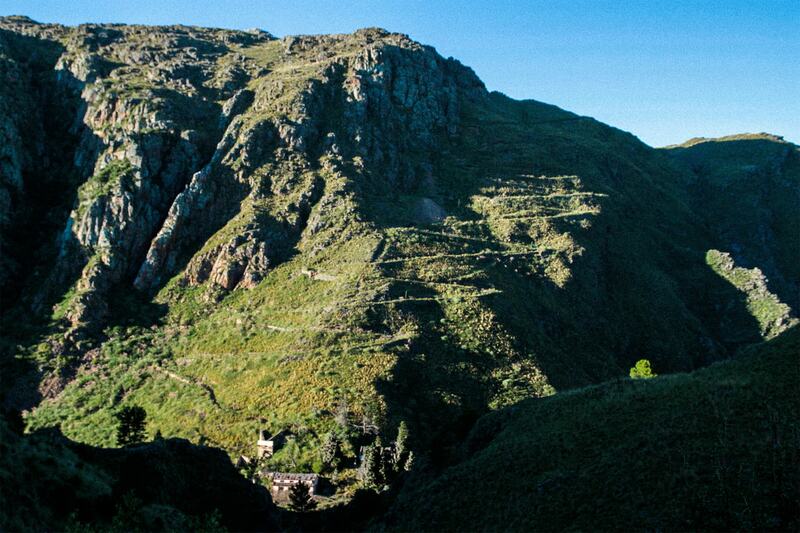 This route would cross villages like Lutti and Cañada de los Sauces, taking me back on a beautiful inclined plane. My Reid literally flies on the descents, the driving position is ideal for accelerating and its carbon fork makes the front train remarkably light, relieving the bumps and wells. The journey back is perfect and so synchronized that the only puncture surprises me just on a shadowy section of the road and with a stream of crystal clear water on the side. The bustling campsite where I slept 48 hours ago, is now a deserted place except for the car that awaits my return. A long shower cleans the traces on my body, produced by the trip that had just come to an end. The Reid, along with its reduced baggage, says mission accomplished and dives into the trunk of my car. 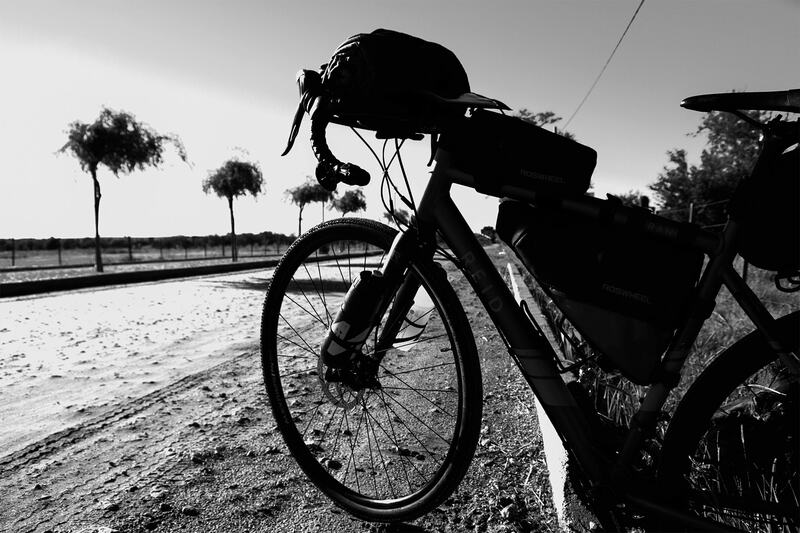 I accelerate on the Cordoba-Rosario highway and the kilometers begin to pass quickly in front of my eyes, mixed with images of climbs, streams, stones under my shoes, entrepreneur gauchos, pasta, card games at dawn, petrified cows.A perfect and fleeting moment in time, just like a Bikepacking trip.